In 2011, Jose Antonio Vargas founded Define American, a nonprofit with a mission to use media, storytelling, and other avenues to shift the overarching narrative as it applies to immigration, identity, and citizenship. 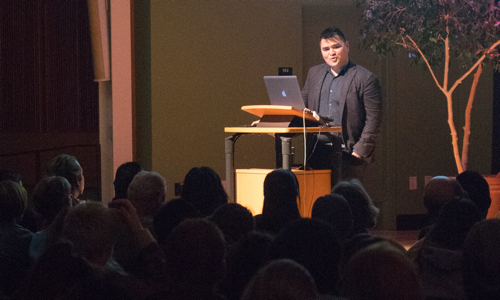 Jose Antonio Vargas, a Pulitzer Prize-winning journalist, documentarian, and activist, gave an impassioned speech on the immigrant identity and the nature of the American dream to a packed house at the University of California, Santa Cruz. “Immigration at its core is about love and sacrifice,” Vargas told the hundreds who gathered at the College Nine and Ten Multipurpose Room to hear him speak on Nov. 30. Vargas was invited to speak on campus as part of Kresge College’s Media and Society Lecture Series. Assigned reading for students in Kresge College's core course, “Power And Representation,” include Vargas’s New York Times essay “My Life as an Undocumented Immigrant.” The talk was also a fundraiser for campus Educational Opportunity Programs. More than $11,000 was raised, and the office continues to accept donations. Despite nationwide efforts to make immigrants feel unwanted, they continue to show up and contribute to the United States in ways that go beyond just mere labor, Vargas said. Vargas’s own contributions to the nation are many and considerable. Vargas was smuggled by his parents from the Philippines and to the United States when he was 12 years old. He grew up in East San Jose with his grandparents. He didn’t find out he was undocumented until he tried to apply for a driver’s license and was told his green card was a forgery. His life was then marked by anxiety—bordering on paranoia—about being found out and deported. “As soon as my grandparents confirmed my green card was a fake, the first thing I did was get rid of my thick Filipino accent,” he said. But his assimilation never erased his pride in his heritage, and despite being constantly haunted by his lack of papers, he was determined to thrive. After graduating from San Francisco State University, Vargas worked at the San Francisco Chronicle and then the Washington Post, where he won a Pulitzer Prize in 2008 for his breaking-news reporting on the Virginia Tech shooting. He left the paper in 2009 for the Huffington Post and began writing articles for a series of prestigious magazines, including The New Yorker, to which he contributed a profile of Facebook founder Mark Zuckerberg in 2010. The years of deception were taking a toll. He tired of making excuses to friends about not being able to attend weddings out of the country, and remaining aloof from relatives because of the pain associated with not seeing his mother for two decades. In 2011, Vargas made a decision that would alter his career and his life. He came out as undocumented. He wrote a cover story for The New York Times Magazine about his experiences as an undocumented immigrant, from his teen years to his life as a professional journalist, working, paying taxes, and living in fear of being exposed. “When I got hired at the Washington Post I thought I had 'illegal immigrant' tattooed on my head,” he said. Not only did the article relieve him of the burden of deception, it led to the next chapter of his career as a documentarian and an activist. He wrote, directed, and produced the documentary Documented: A Film by an Undocumented American, released in 2013 and broadcast by CNN in 2014. In 2011, he founded Define American, a nonprofit with a mission to use media, storytelling, and other avenues to shift the overarching narrative as it applies to immigration, identity, and citizenship. Vargas continues to function as the organization’s CEO. “It is a joy and a privilege to have the resources to frame the narrative of undocumented people,” he said, saying he strives to present the immigrant experience with more complexity and nuance than the typical tropes of babysitters, farm laborers, and cheap labor. Vargas insists he is not attempting to flaunt his illegal status, undermine the rule of law, or advocate for an open borders policy. Instead, he is using his platform and his voice to ask questions about who gets access to citizenship and why. Vargas acknowledged the prevalence of undocumented students throughout U.S. universities and at UC Santa Cruz in particular, a recognition met with applause. Other students said they hoped Vargas’s talk could be a rallying cry for the UC system to do more to protect and support undocumented students. Kresge College Provost Ben Leeds Carson said the university had a responsibility to do so. Carson urged students to learn more about the Educational Outreach Program and explore ways to get involved with campus efforts to ensure the retention and graduation of undocumented students at UC Santa Cruz. “These efforts must be better acknowledged and supported on this campus,” Carson said.